Griffin's Sheepmoth is a member of the Wild Silk Moth Family. 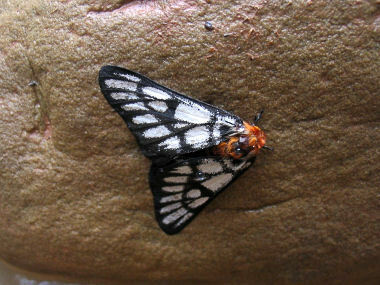 They have black and white wings and orange heads with a wingspan from 1.75 - 3.0 inches in width. Males have a black abdomen with a red tip, while the abdomen of females is banded with red and black. They live in high desert scrub areas and range from southern Utah south to central Arizona, and west to southern Nevada. Griffin's Sheepmoth caterpillars feed on their host plant, which is the Blackbrush. Adult moths do not feed. Adults may be found flying between August and October. They typically emerge in early morning and mate in late morning. Females lay eggs in early afternoon in bands around twigs of the host plant. Eggs overwinter and hatch in April; the young caterpillars feed together and when older they feed alone. Fully-grown caterpillars may wander for 2-4 days before making loose cocoons under plant debris or in sandy soil.